If Nevada was famous for only one thing it would have to be Las Vegas. This gamblers’ city with its glitzy entertainment, flashes its garish neon lights day and night out into the surrounding Mojave Desert. Yet the state has many more amazing attractions that are worth exploring, especially if enjoying the great outdoors is a vacation priority. 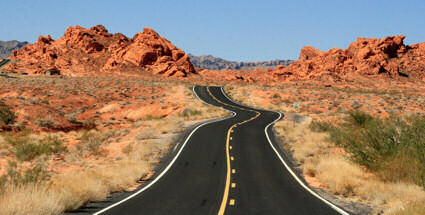 Nevada is America’s seventh largest state, but is not heavily populated. Known as the Silver State, due its historic mining background, Nevada’s major industry is now tourism, though mining still plays an important part in the economy, especially gold mining. The majority of the population lives in and around Las Vegas, and the state has a long western border with California, with Utah and Arizona to the east and Oregon and Idaho to the north. The hub of Nevada’s tourist industry, Las Vegas offers a 24/7 entertainment experience, with its grand hotels and casinos, such as Mirage Las Vegas, stunning theatrical and musical experiences and restaurants ranging for the ultimate in fine dining to modest but high quality diners. The city also makes a good base for seeing what the rest of the state has to offer. Right on the Californian border and shared by the two states, Lake Tahoe is the perfect spot for those who love the outdoor life. Set high in the Sierra Nevada, the summer months offer opportunities for sailing, waterskiing and swimming, and there are endless trails for mountain biking and hiking. Camping is a popular way to bed down for the night. During the winter, sports such as skiing and snowboarding come into their own, and being Nevada, there are plenty of casinos to choose from for some evening entertainment. Nevada is home to the mysterious Area 51, and state highway 375, which runs to its north-east, is known as the Extraterrestrial Highway due to the number of reports of UFO and other strange sightings. The town of Rachel is in the midpoint of the road and has plenty of alien-themed hotels and restaurants for those interested in the possibility of other life forms in the universe. If the full-on intensity of Vegas doesn’t suit, then Reno is a good alternative with a concentration on the gambling rather than the glitzy showbiz of its larger cousin. The city also has great shopping malls and excellent restaurants, and in the days when divorce could be problematic its liberal laws established it for many years as the divorce capital of the world. Dotted around the state are the remains of what were once thriving communities, and many of these ghost towns can be visited to get a sense of perspective on local history. Metropolis, north of Wells, used to be a farming town, but circumstances gradually forced its inhabitants to leave. There are still examples of architecture from the early 20th century to be seen. Rhyolite, north-east of Vegas effectively became a ghost town in the early 1920s, but there are spectacular sculptures to be seen at the Goldwell Open Air Museum; strange and iconic shapes can be viewed for free.